An “electronic nose” sensor being commercialized by Innovation Economy Crowd (ieCrowd), will be further refined to detect deadly pathogens. An “electronic nose” sensor developed by a University of California, Riverside engineering professor, and being commercialized by Innovation Economy Crowd (ieCrowd), will be further refined to detect deadly pathogens including toxic pesticides in the global food supply chain, according to a recently signed product development and distribution agreement. Nano Engineered Applications, Inc. (NEA), an ieCrowd Company, signed the multi-year, multi-phased agreement with a collaborator, whose name cannot be disclosed because of a confidentiality agreement. The collaborator is working directly with ieCrowd’s team members and Nosang Myung, a professor at the UC Riverside Bourns College of Engineering, who is excited about the progress. This is the first such agreement signed by NEA in relation to Myung’s “electronic nose” sensor research, which involves a nano-sensor array that can detect small qualities of harmful airborne substances. 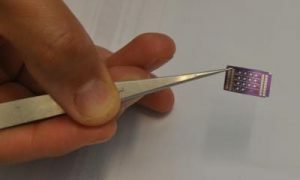 It uses functionalized carbon nanotubes, which are 100,000 times finer than human hair, to detect airborne toxins down to the parts per billion level. Using ieCrowd’s commercialization platform, NEA is developing a range products and applications for a diverse set of industries, including industrial sites (detecting gas leaks, combustion emissions), homeland security (warning systems for bio-terrorism) and the military (detecting chemical warfare agents). This new collaboration will be the first time the sensor will be customized for food safety and potency measurements. In a unique partnership with UCR, ieCrowd is currently incubating and accelerating two professor-owned companies, including NEA, derived from research developed on UCR’s campus. “The work being done by NEA and Professor Myung represents the great potential of the strong and close partnership between ieCrowd and UCR. This agreement highlight’s ieCrowd’s mission to transform innovations into real products with global impact potential,” Abbott said. “We are pleased to be working so closely with the university on a number of fronts to create social and economic benefit out of some of the world’s great research and innovative work being done at UCR – just as we are doing with the great work done by Professor Myung with NEA,” he continued. This agreement calls for the development of products and a testing platform capable of detecting specific volatile organic compounds released by plants when heated to specific temperatures. The agreement is comprised of two phases: first, establishing efficacy of NEA’s sensors with these volatile organic compounds; and second, should phase one be successful, the development of hand-held products to detect volatile organic compounds.